Mike, Scott and I went to Opie’s today to check it out. It works on the same premise as Cooper’s: select the meat you want from the grill (I want that pork chop and that piece of sausage). It definitely has a small-town feel on the inside. It’s also a nice pleasant drive. Interestingly, one of the staff there mentioned that @tmbbq would be there a little later that day with a tour group. Quite a few things were tried today, so let’s dive in. I ended up trying turkey, brisket, original sausage, pork loin, pork ribs (and pork chop and baby back ribs at home), and a bite of Scott’s sausage. Scott had pork loin, brisket and jalapeno cheddar sausage (and a bite of my turkey). Mike had brisket and pork ribs, took a pork chop home, and had a bite of my turkey. We all got moist brisket. Pork Chop: The pork chop was tender and juicy. It had a nice crust. Interestingly the bite of Scott’s I tried onsite had the strongest smoke flavor of anything we tried, and smoke was the strongest flavor in the chop. The one I had at home had a much stronger black pepper flavor (a plus in my book). Scott: This thing was the size of one of Spurs forward Kawhi Leonard's hands (i.e. insanely huge). It's also as thick as about 3 decks of playing cards stacked up. I had a few bites at the restaurant and brought the rest home. Later this evening, after I emerged from my BBQ Coma (it's a recognized medical condition nowadays, right? ), I heated it up and dug in. Great flavor still abounds. Tender, meaty, juicy. I'd be curious to experiment the next time at Opie's with trying the Pork Chop first. Brisket: The brisket was extremely moist and tender, with a nice bark. It had a light smoky flavor and pretty much melts in the mouth. Scott: Beautiful color on the bark, flavor through and through the meat. Almost falling apart when making contact with fingers or utensil. It melts in your mouth, not in your hands (if I may borrow the catchphrase). Pork Rib: The pork ribs have a lot of meat on them, and a good crust. They have excellent flavor and taste wise are one of the best I’ve had. It’s just a smidge tough. Tom: 9.0/10. Pork Loin: The pork loin is tender, juicy, and has a nice crust. As with most of their items the smoke is light and adds nicely to the flavor. Scott’s comments (Tom doesn’t like jalapeno): Excellent snap to it. As I had a full link, ok two, I got a some variance between the cheese and jalapeno at various intervals. Again, this is an art not a science. It's part of what makes the eating experience fun. The spiciness of the jalapeno had a wonderful time release effect, but was never overwhelming. Flavorful, juicy, and excellent throughout. Scott - 9.5/10. Turkey: The turkey is extremely tender and juicy. The light smoke combines well with the rub. We agree this is one of the best turkeys we’ve had. Scott: I had one bite, but oh Lord have mercy, what a bite. I found it very interesting that there wasn’t a long line at Opie’s. Cooper’s usually has a line on a Sat. The only reason I can think is location, as Opie’s can definitely hold their own in terms of quality. Everything we tried rated in the exceptional range. 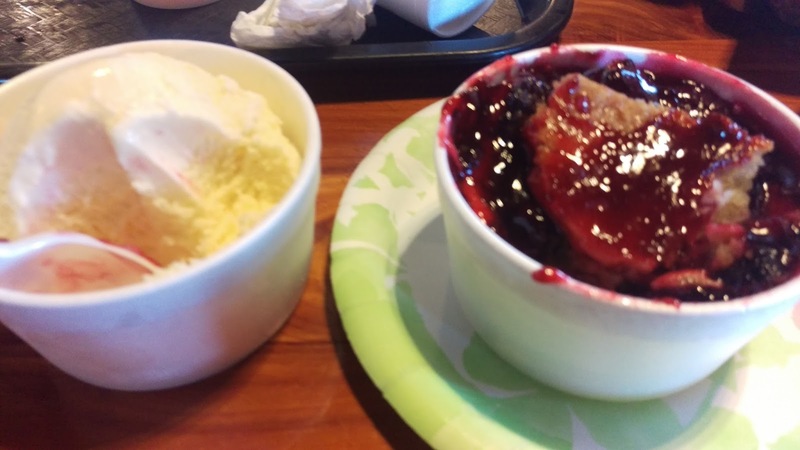 Scott: We don't grade sides or desserts, but that Blackberry Cobbler was sensational. Worth making room for. Mike: The butter beans (sold Fri – Sun) are definitely also excellent and worth trying. Is it worth a visit? Absolutely. Is it worth a trip? Again, absolutely. It’s a nice trip out and back, and the BBQ is definitely worthwhile! This is quite possibly your most entertaining post yet. I enjoy the interplay between the different "voices". Also, I can't recall offhand if you've ever rated a place this highly. It's a pretty close drive if it's really that good. I also like the ornery sign about the butterbeans. Every barbecue joint needs to have a touch of orneriness just to keep things interesting. Your post has many detail information. I read all of your article and I genuinely like it. Thank you for discussing this great post.